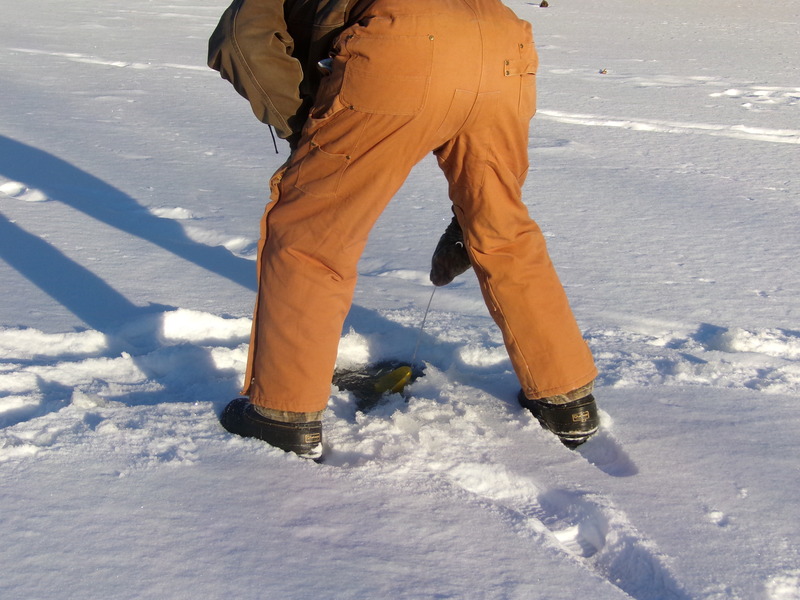 My Second Impression of Ice Fishing was Far Better Than My First. Well, I have to say this feels oddly full-circle. Sunday afternoon and evening were spent doing the activity I started this blog on back in January. We got out on the ice for the first time since early March. 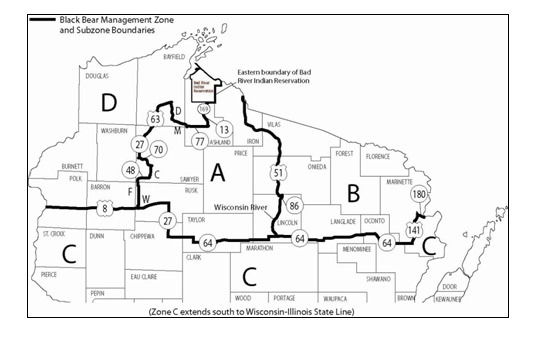 Originally, we had planned on hunting Sunday evening, since the CWD antlerless hunt is going on right now. 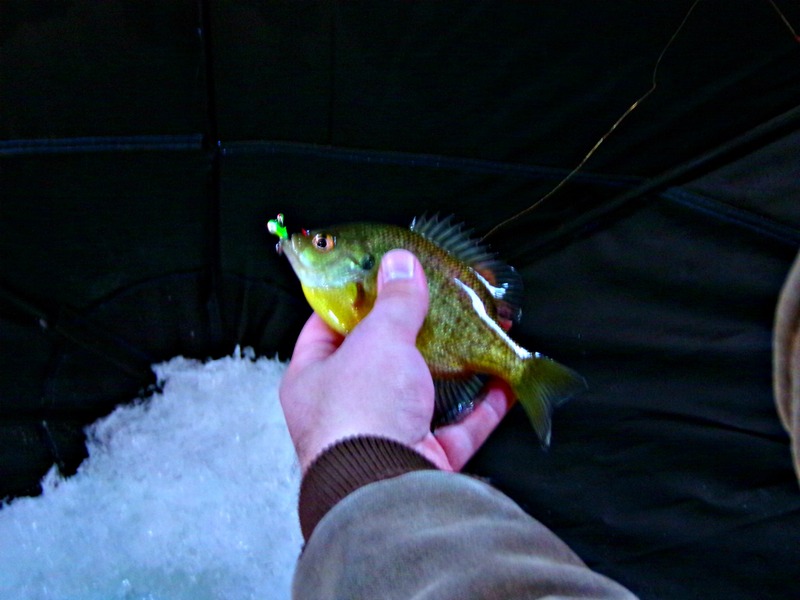 But between really wishing for a buck, and some more extreme cold weather, we decided at the last minute to head out ice fishing with our friend, M. We packed everything into his truck, and headed up to a spot he knew near Portage, Wisconsin. It was a sunny day, if cold. The high for the afternoon was about 10F, and we reached it at noon. 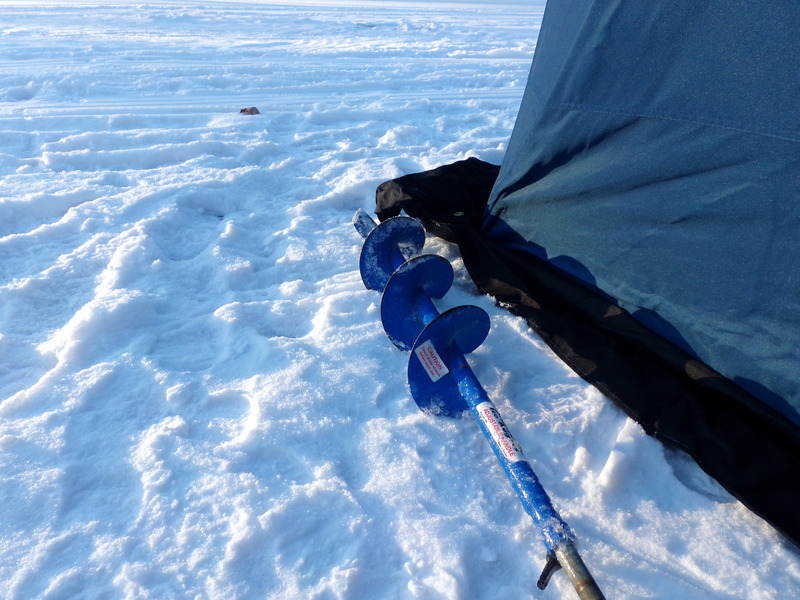 We arrived at the frozen-over launch around 2:30, dragged our sleds out onto the snowy lake, and got to drilling some holes. M boring a tip-up hole. Shanty and our stuff scattered all over the ice. 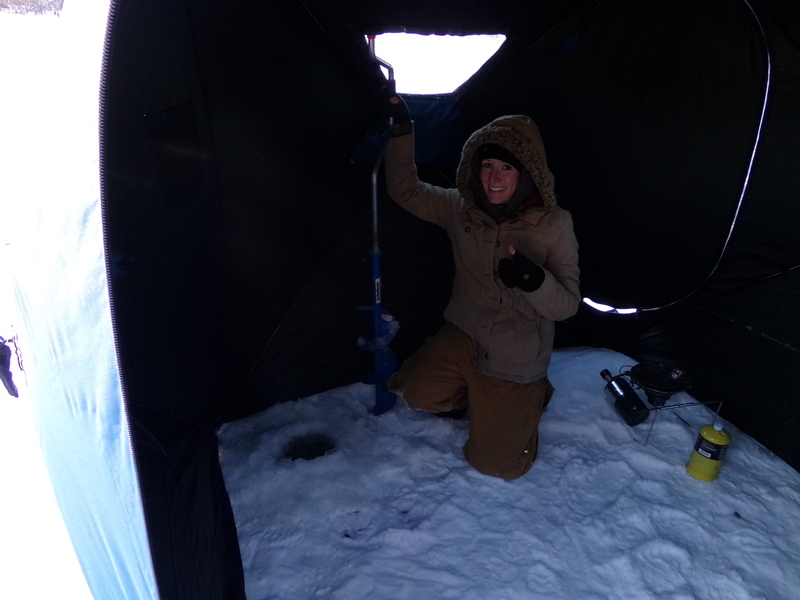 I finally drilled my first complete hole through the 4 inch thick ice. In single digits, water freezes quickly. 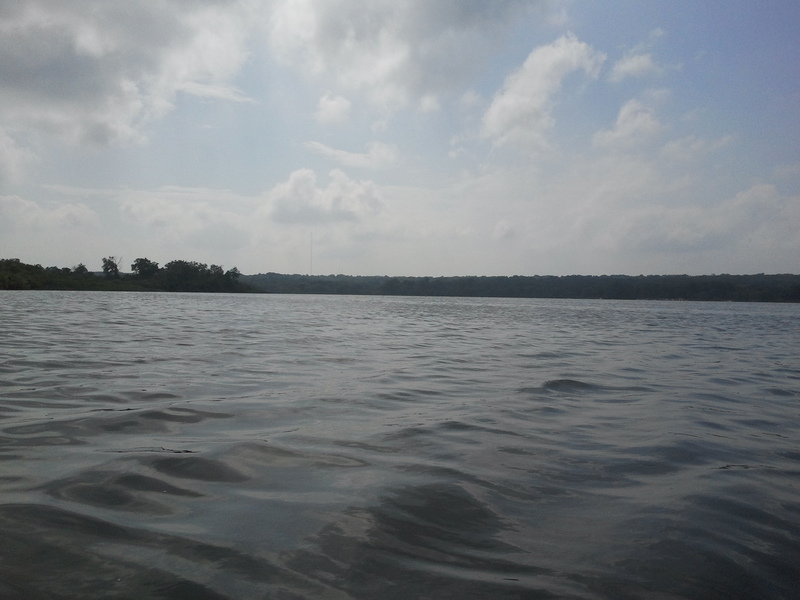 We were in fairly shallow water, 6-10 feet or so. 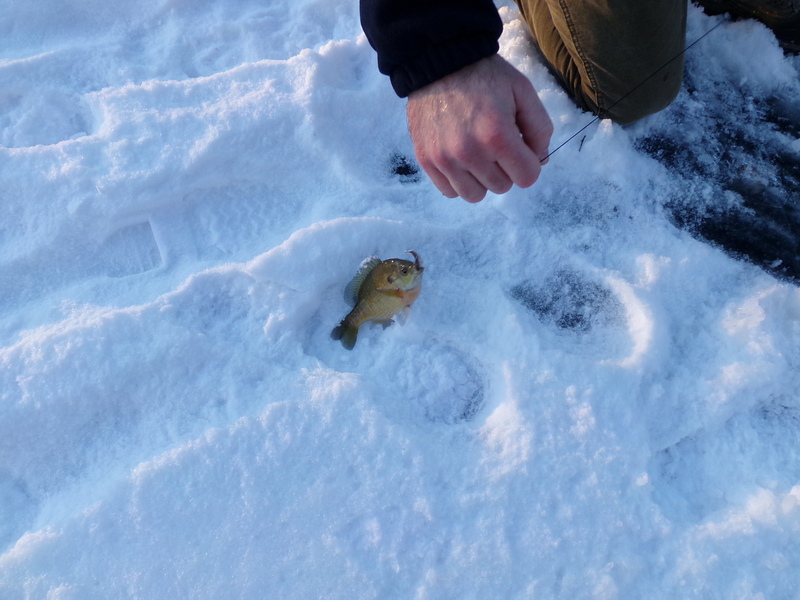 And the ice was rather thin, about 4 inches. Safe enough to walk around on, but definitely not the 18 inches we were drilling through last February. 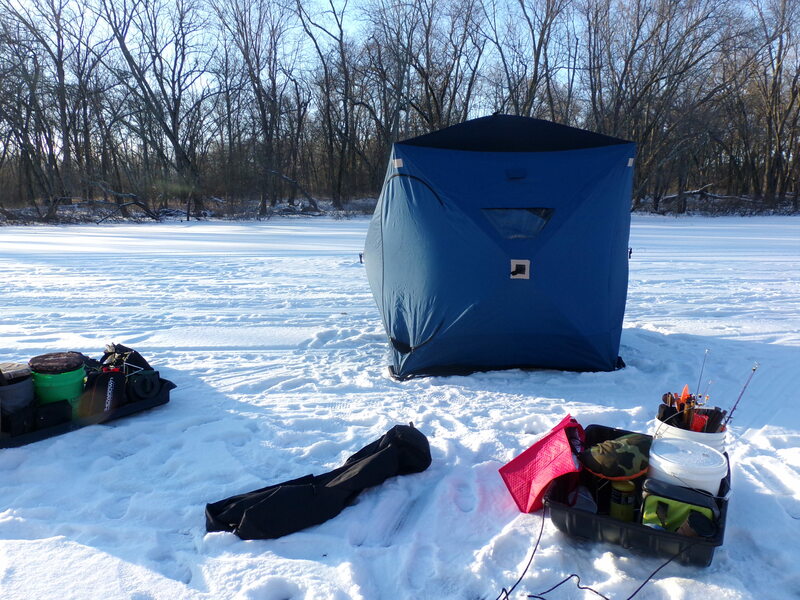 The rules about number of lines still holds, so we usually do two tip-ups per person, plus one line inside the shanty, jigging.Our tip ups had minnows on them, and we were using jig heads tipped with wax worms inside. The action started inside the shanty. 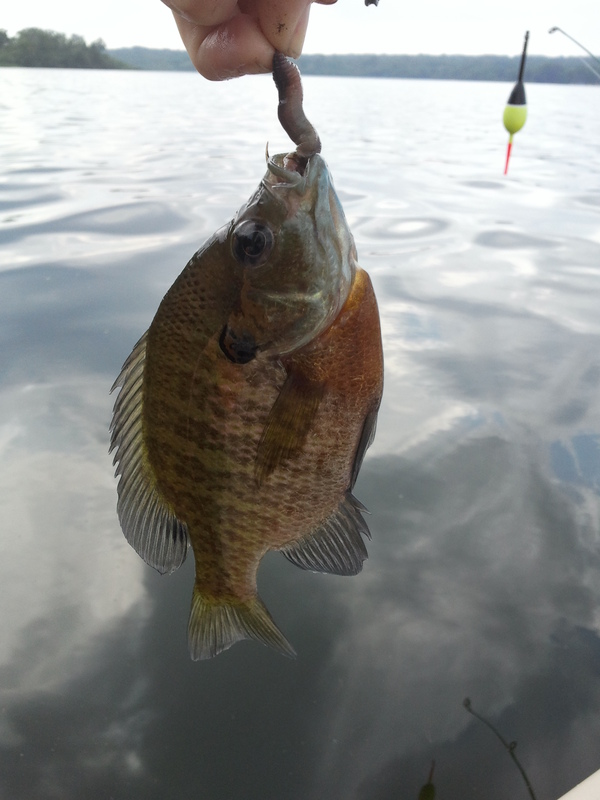 Matt was on some bluegills, and had the first three fish of the day, which all went back in the water. But soon after, we had two flags on our tip ups. 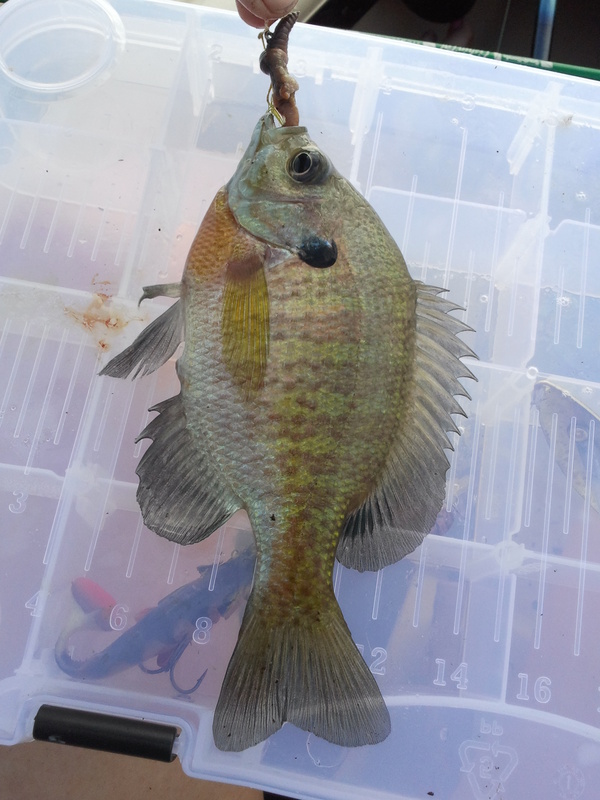 We rushed out to get those in, and it was more bluegills. 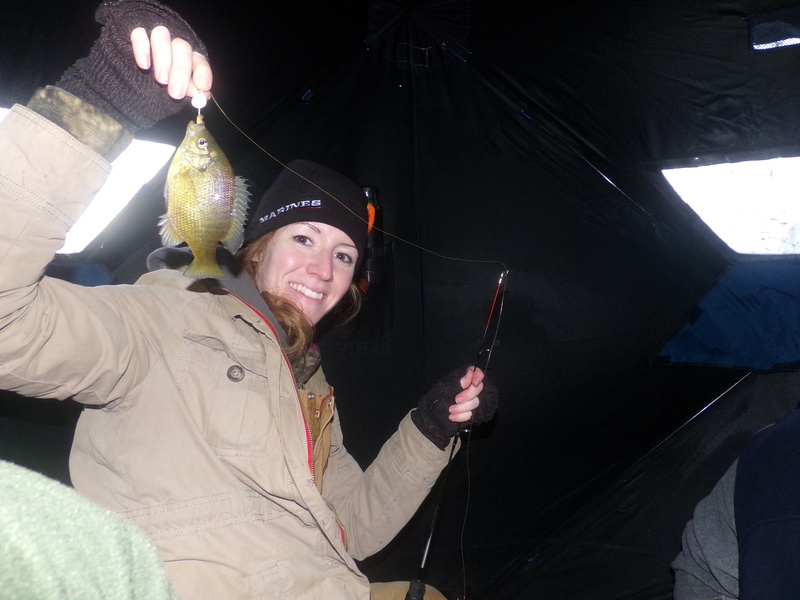 We headed back after all that to get warm by the Mr. Heater and to continue jigging- the fish were biting! 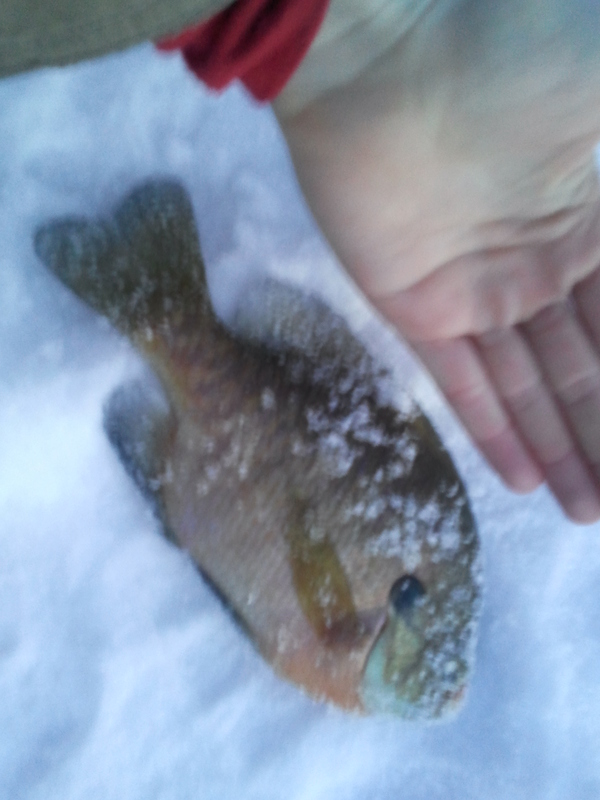 And then I finally got my first fish through the ice. Last year was a rough season, and in the first 45 minutes we’d tied, and then exceeded last season’s catch. 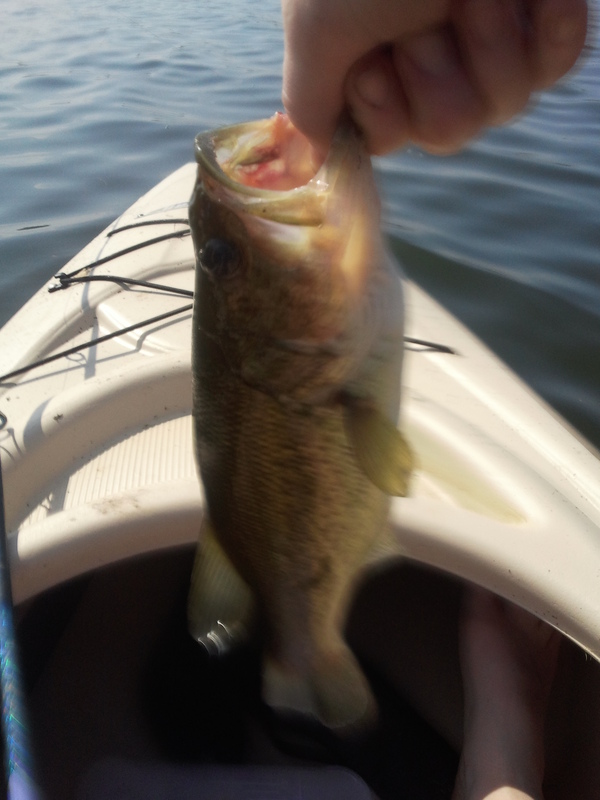 Matt would pull out a couple more fish, as would M and myself. 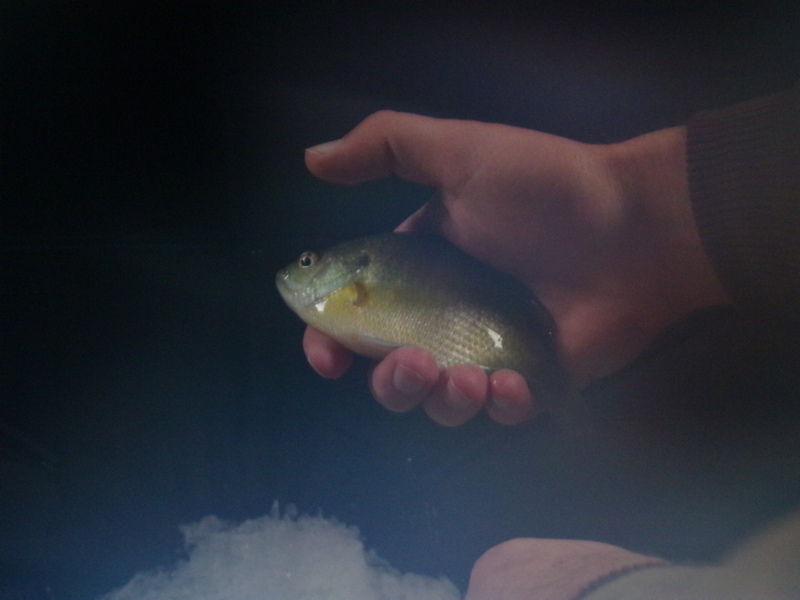 Only 7 or so were keepers of the bunch, and but for a couple perch, they were all bluegills. 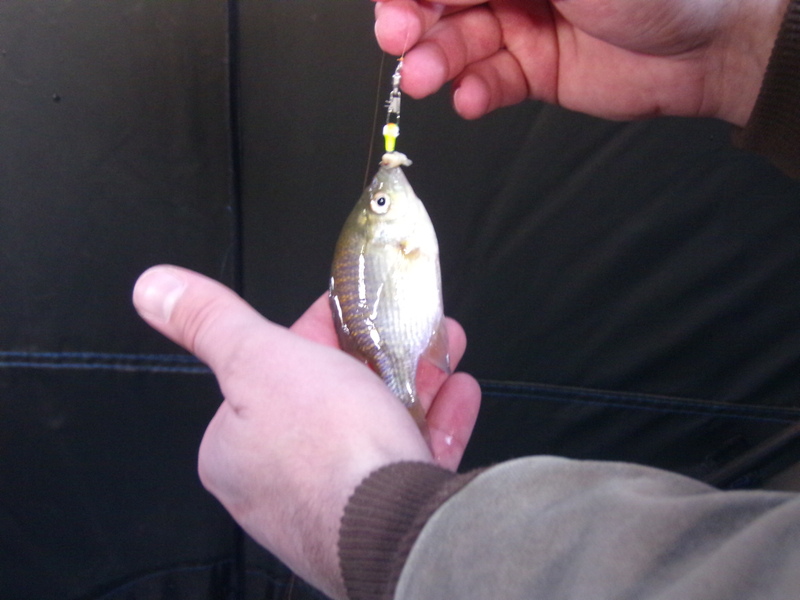 The bite slacked off along with the daylight, so we called it around 5:30, and packed in our gear in the cold. 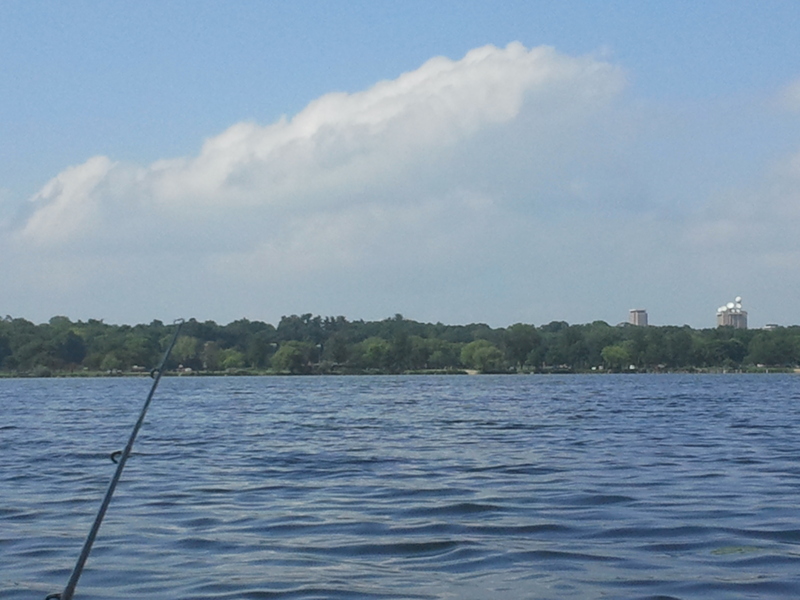 It was a clear day, though, and we’ve got fish to fillet, some of them nice and big. 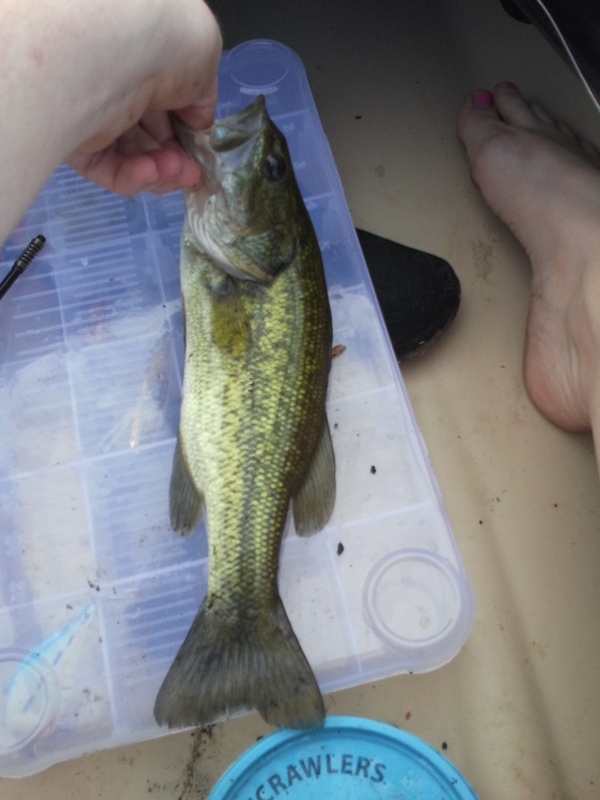 My biggest ‘gill of the day. When it’s this cold, the world is your ice box. 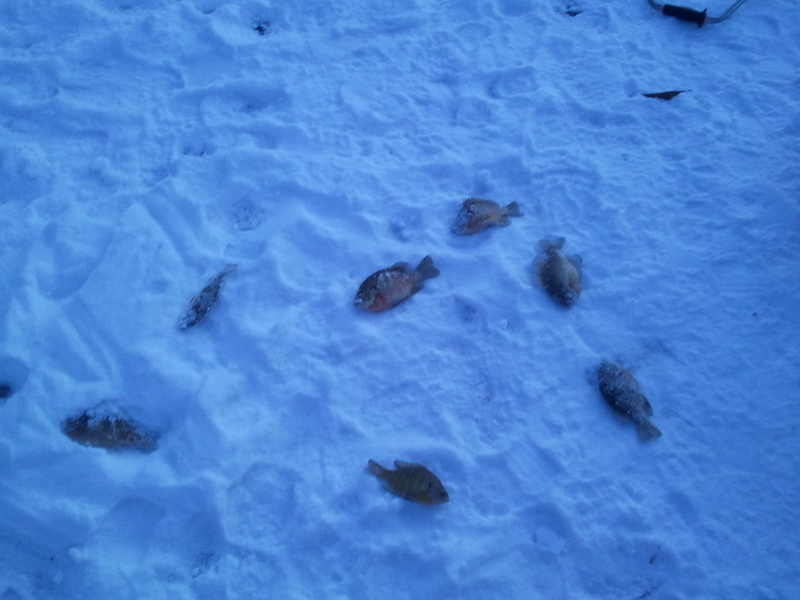 Our catch, on ice just outside the shanty door. 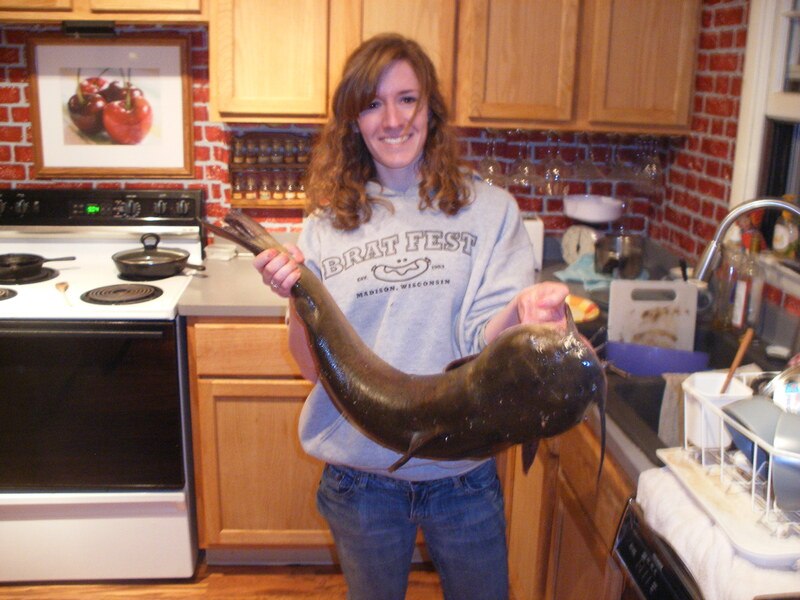 We’ve already marked two fish derbies on our calendars, too. 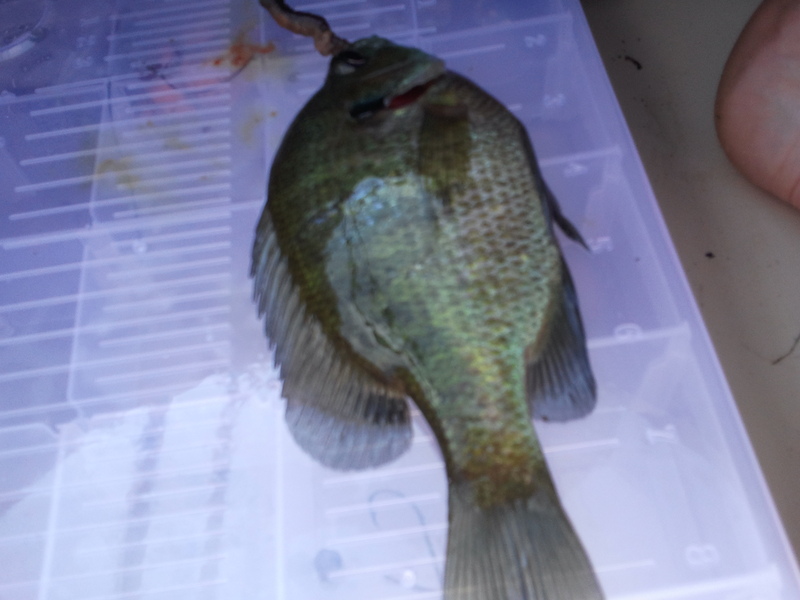 One on January 18th on Lawrence Lake, and then the one on Lake Waubesa in late February or early March. 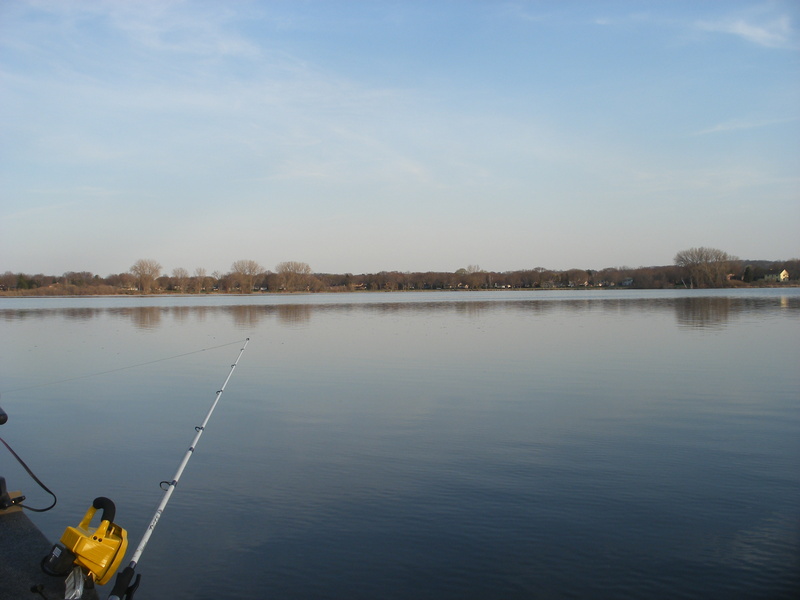 Hopefully, we can start pulling out some pike and bass in addition to the panfish. I finally make my return after a several day absence. We returned from Deer Camp and Thanksgiving late on Saturday night. This will probably be the first of three or so posts on the last weekend of gun season. On the one hand, we had incredible luck- we returned from northeast Wisconsin with two deer strapped to our cargo carrier. On the other hand, we had what I can only call Pech. It’s the German word for bad luck, but it’s also the German word for pitch (pine tar, not the action in baseball). The German word for good luck, Glück, only really has positive connotations, and making the straight antonym of it doesn’t quite reach as far as I’d like. Pech describes our circumstances so much better, both because of the negative connotations, as well as the idea that it just sticks to you and doesn’t come off. The bad luck enters when I didn’t fill any of my tags or see deer, when Matt backed the truck into a tree, mangling our cargo carrier, and when the scope on my rifle came loose. Oh, and the fact that the week before we arrived, most of Matt’s younger cousins had been running amok all over the hunting land. The roads were rutted all to hell from inexperienced teenagers attempting to drive off road, we found bottle rocket leftovers in front of the cabin, they’d shot two porcupines, and the deer were spooked for miles around. Short linguistic tangent and rant about Kids These Days over, I’ll sum things up with words before throwing up a huge gallery of photos. The two deer were both Matt’s work. I got video of the first, as we were sitting next to each other on the edge of an unused cow pasture. The video is saving as I type, and I have yet to even upload it to YouTube- it will go up this afternoon, I suspect. It was a great shot, and he was happy to get it out of the way. That one he got on Thanksgiving day, as we headed out from dinner at his grandparents to hunt that pasture down the road. She was a little doe- probably a yearling. We hunted that same pasture Friday night after helping his dad with some projects, and getting the blower fan in the truck replaced (in other news, the Durango has heat for the first time since we bought it. Hooray!). However, Friday night, his dad and his youngest stepbrother also hunted the pasture. Poor little kid has both inadequate gear and instruction in hunting- it was about 10-15 degrees Fahrenheit all day, and he got cold fast. He was shivering audibly, and left his stand with about 35 minutes of light left. His stand was right on the trail the deer came from on Thursday night- we weren’t going to see anything. I doubt anyone told him he has to stay out until damn near full dark. Saturday morning, we hunted but didn’t see anything. The trail camera we put out over a bait pile the night before picked up images, however, so it was heartening. The deer were getting unspooked after a couple quiet days. 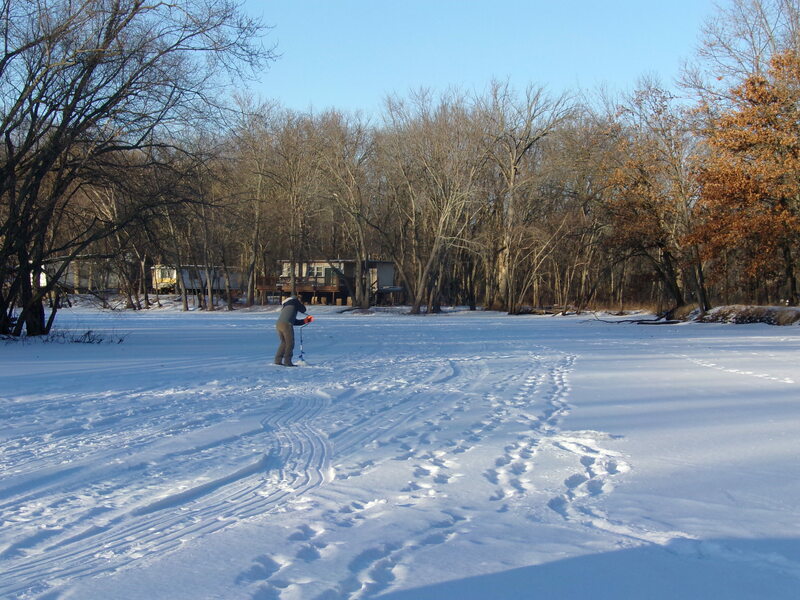 Saturday afternoon, we replenished bait piles that were gone Saturday morning, after not having been hit for days. 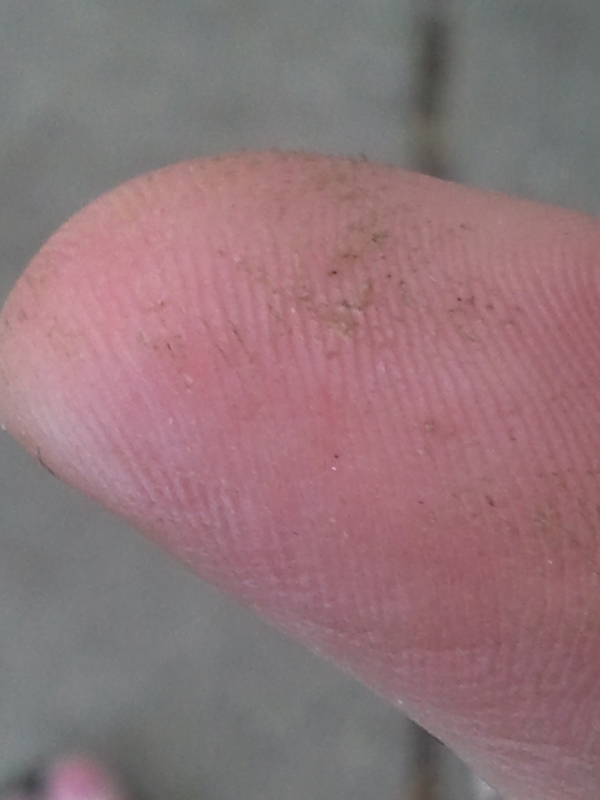 Saturday evening, I didn’t see a thing, in spite of heavy sign and a rub near my stand. I would hear Matt shoot, and that’s when he got his second deer- a much bigger doe we had captured at the same bait pile the night before, and I suspect the one I passed on back in September. She’s a biggun. Lengthy summarization over, let there be photographs. Ice from the creek stacked next to the fan boat. It’s only late November, and the creek is frozen solid enough to walk on safely. Snowy cabin and pine trees. Snowy trees and forest service road. Perfect Christmas trees everywhere. Big old turkey tracks at the pasture gate. Small body, slender neck, and a short snout and face- definitely a young deer. Friday dawning in the single digits, and hoary frost everywhere. Every tree and blade of grass covered. And this one’s all mangled. To be fair, there was road grit mixed with snow all over the back window. Matt and the second doe on the last night. Legs. Everywhere. Since the carrier was mangled, the legs sticking out was how we made sure the deer were there while still going down the highway. Matt and I replenishing the bait pile near the cabin with apples on Friday night. The first deer showed up two hours later. A little fork with a big body. The curse of these woods- small antlers. This doe was very suspicious of the thing flashing bright light at her in the utter darkness. So, the video should go up this afternoon. 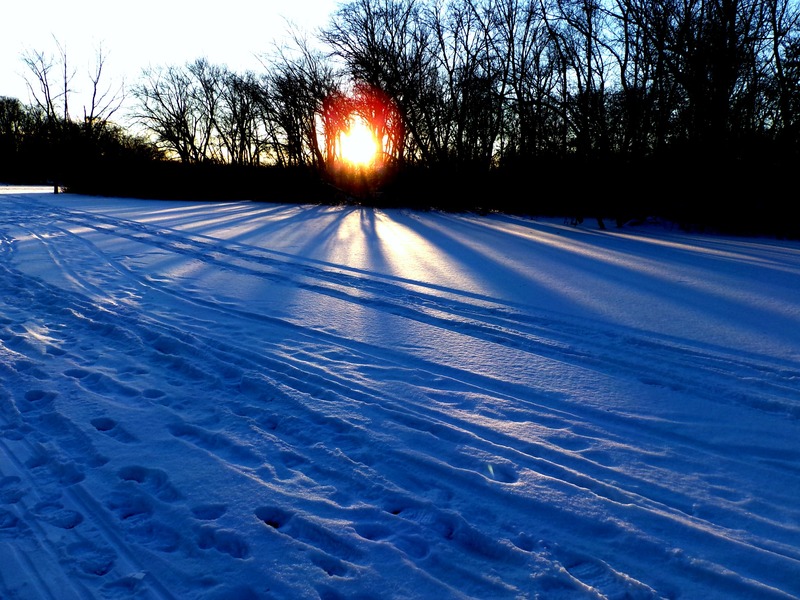 Tomorrow I’ll have a post about the last evening of gun season down in Madison tomorrow. Black powder rifle season started at sun up today, and goes until this Sunday. We basically get a chance to fill any tags left over from gun season. According to Matt the moon phase today and tomorrow is good for hunting- I may make it out tonight. 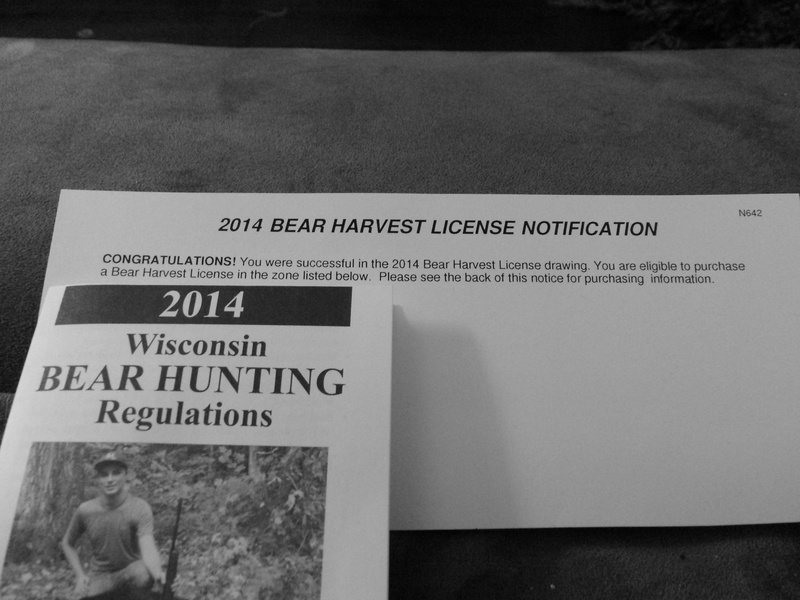 This weekend we hope to be heading to a kind acquaintance’s out in Richland Center to hunt with our muzzle loaders.